During my research today I found this interesting infographic. The date from it is from 2012, so the exact figures on it are likely to be wrong, but I would bet the trends are the same. My reason for saying so is because I am one of the developers that, up until recently, has spent little – actually almost no – time marketing my apps. When My Food Storage first was released, I did a press storm. I created a press release, and cold pitched it to everyone I could think of. That increased my downloads by about 50 that week. Not exactly awesome numbers. I think that of the 100+ PR’s I sent out, maybe 3 places did anything to review or post my app anywhere. I literally haven’t done anything with Go Coder, besides a couple of tweets that were test tweets that were actually seen by a few people. Personally, I don’t think that I will need to spend any money – actually I hope this with all my heart because I have no money to spend – to do the marketing needed to get apps in front of more people. But I do believe that without spending money I will need to spend a significant amount of time marketing my apps. Well, enough about why I am where I am – for now – lets get to the infographic. Hopefully this will help some people understand what we need to be doing to get our apps in front of people. Enjoy ?. Do you have something else to add? Is there something missing I should know about? How has your marketing been working for you? 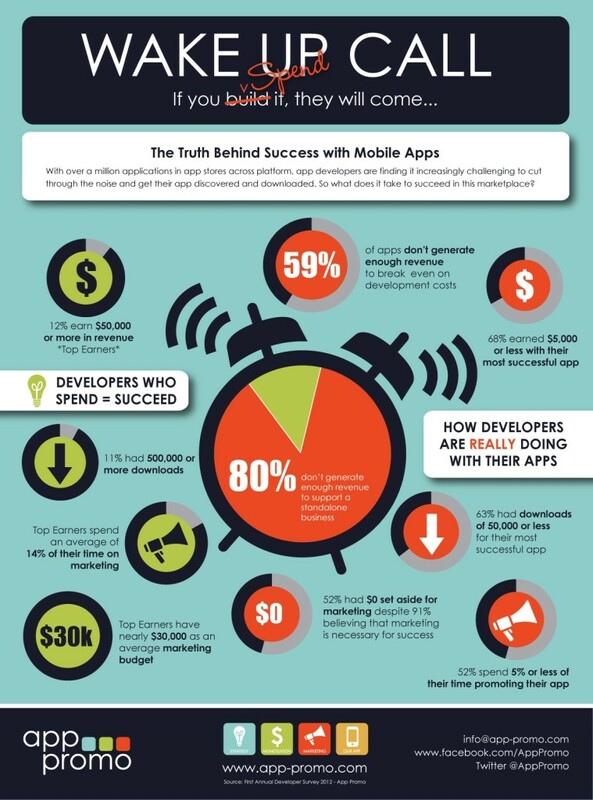 I would love to hear success stories with marketing mobile apps, but either way look forward to hearing from everyone!